Question: Whenever I pull up one of the rockfish species that is not legal to keep, its swim bladder is usually so full of air that even if I throw it back it will still die. What’s the point in throwing them back if they’re just going to die anyway? Answer: Rockfishes brought up from depth often arrive at the surface with an inflated swim bladder. When released, they are too buoyant and cannot freely swim back down. 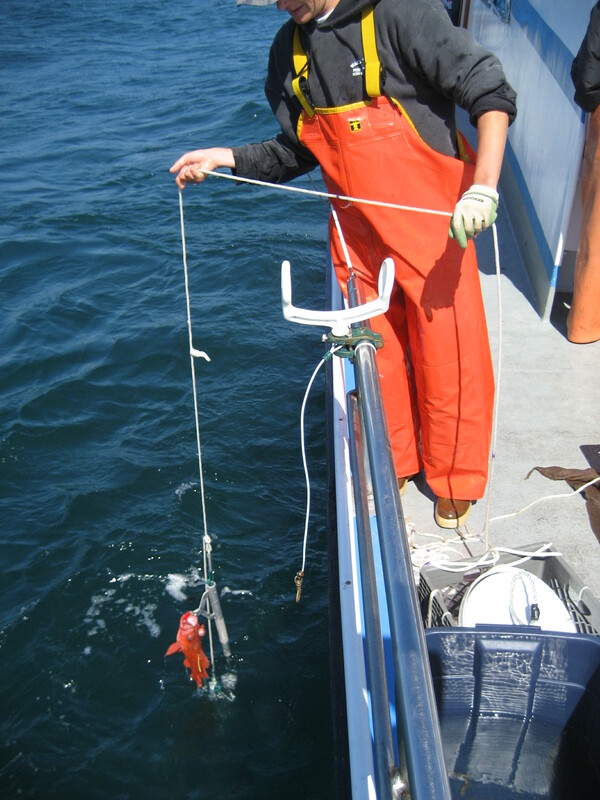 Even slowing the speed of the retrieve will not increase the likelihood of survival of a released rockfish. According to DFG Associate Marine Biologists Ed Roberts and John Budrick, rockfish take a considerable amount of time to transfer gases from the swim bladder (buoyancy compensating organ) through their blood stream and out through their gills. The rate at which a fish would have to be brought up from depth to alleviate the effects of barotrauma (pressure-related injuries) would be far slower than any angler would be willing to reel. Instead, the best solution is to bring them up as fast as possible to minimize stress on the fish. Then, using a descending device, get the fish back down to the bottom or a minimum of 100 feet within two minutes of arriving at the surface. Mortality rates double for every 10 minutes beyond the first two minutes according the research conducted at California State University Long Beach (Jarvis and Lowe, 2008). A simple release tool consisting of a heavy weight, line and barbless hook can be used to send a fish suffering from barotrauma back down to a depth where the increased pressure will compress the bladder gases that expanded at the surface, and thus allow the fish to swim away. This is a handy piece of tackle that all conservation-minded anglers should consider adding to their tackle boxes. You can make your own release device or purchase a commercially made device at many tackle stores. Another option is an inverted milk-type crate, with a rope attached to the top (what was previously the bottom) and weights at each corner. This creates a bottomless cage-type contraption which allows the fish to equalize and swim out of the bottom, which happens nearly as soon as the cage reaches the depth where the fish was caught. Research conducted at California State University Long Beach indicates that rockfish from the Southern California Bight returned from a depth of 200 feet to a depth of 350 feet using a cage had an 83 percent survival rate after five days (Jarvis and Lowe, 2008). Similarly, research by the Alaska Department of Fish and Game on yelloweye rockfish caught in waters as deep as 600 feet showed more than 95 percent survival of the fish returned to depth (Hochhalter et al, 2010). The significant decrease in mortality rates from nearly 100 percent of fish released at the surface in depths greater than 180 feet to the vast majority of fish surviving when a descending device is employed is very encouraging. Anglers can contribute greatly to the recovery of overfished prohibited species and small fishes that would otherwise die by using a descending device. Don’t just let them go, let them grow! One important note: Please do not attempt to vent the expanded gases by puncturing the fish. Many anglers will take a knife or other sharp object and poke a hole in the organ protruding from the mouth. This is the stomach, not the swim bladder! Puncturing the stomach decreases the fish’s odds of survival, and may introduce infection-causing microorganisms. Some anglers attempt to deflate the swim bladder by inserting a hypodermic needle into the side of the fish to vent the gas. This is not recommended. Even if you insert the needle in the correct location, you may end up puncturing an organ like the liver, heart or other structures that will kill the fish. Also, unless you are using a sterile technique, your efforts may result in an infection that kills the fish. If no descending device is available, the fish may be better off floating at the surface rather than suffering a mortal injury or infection from a well-meaning but untrained angler. Just because a punctured fish swims off does not necessarily mean it will survive – it may die later of injuries or infection. As to why specific fish must be released, harvest quotas for overfished species are so small that there is no allowance for directed take. Allowing anglers to keep fish that are caught incidentally while fishing for other species may result in unethical anglers intentionally targeting these species, thus jeopardizing the plans to rebuild these populations. Bottom line … To increase survival, use descending devices to return the fish to the bottom or a minimum depth of 100 feet within two minutes of being brought to the surface. This method does not carry the risk of infection or injury and greatly reduces mortality relative to leaving fish at the surface to perish due to sun exposure or predation. For more on how to help fish survive barotrauma, please go to http://www.dfg.ca.gov/marine/pdfs/release.pdf. This entry was posted in Catch & Release, Fishing and tagged ocean fishing. Bookmark the permalink. Thanks for the great tip. Will be using the milk crate I have sitting around.I think it would be helpful to point out in this response the incredible age rockfish can achieve as well as age to maturity as it relates to value of returning incidental catch to their normal environment. I find it has had an affect on my catch numbers knowing that some of these fish have been around far longer than I. Those of us who enjoy the fruits of this fishery share guardianship of these fish with mother nature. Lets do our job by doing everything possible to increase survivability of this great fishery. Help sustain rockfish fishery – send incidental catch back down with care. Thanks for the info. Being a mostly catch/release fly angler, I was very turned off by a recent charter trip off Oxnard where I wasn’t informed of the swim bladder or barotrauma and the sight of so many under-sized, stomach-popping-out-their-mouth fish floating helplessly on the surface was extremely unpleasant. There was no mention of a proper return method.